August 14th is National Creamsicle Day. 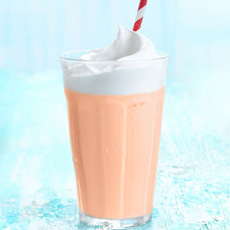 Creamsicle is a flavor combination that people either love or not. We love it, and have even created our own variation, The Nibblesicle, with raspberry sorbet instead of orange. The Creamsicle was created by the Popsicle Corporation, established during the Depression by Frank Epperson, who had invented the Popsicle®. The vanilla ice cream pop, coated with orange sherbet, became a sensation. Today Creamsicle® and Popsicle® are registered trademarks of the Unilever Corporation. Here’s more Creamsicle history. On each National Creamsicle Day we try a different variation of the vanilla and orange combination. This year, it’s shortcake. Links to previous years’ recipes are below. This year’s recipe was inspired by a shortcake photo (photo #1) from Cindy’s Rooftop in Chicago. The restaurant calls it Dreamsicle Cake. You can bake individual angel food cakes in muffin tins, as shown in the photo, or bake or buy a cake and serve conventional slices. Cindy’s Rooftop uses a white chocolate sauce. We made crème anglaise (recipe below), a thin custard sauce. Raspberry purée would have pleased our palate, but it doesn’t fit with the vanilla-orange profile. 1. SUPREME the orange segments (here’s a video) and set aside with the juice. This can be done a day in advance. If garnishing with orange peel curls, peel the curls before segmenting the orange. 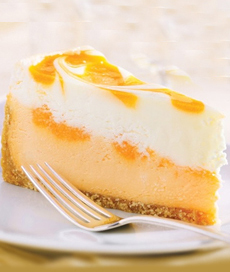 Prefer a cheesecake? Here’s the recipe (photo courtesy Sweet Street Desserts). 2. MAKE the crème anglaise (this can also be done a day in advance). Combine the milk and cream in a small pot. Split the vanilla bean and scrape in the seeds. Bring to a simmer and remove from the heat. 3. WHISK the egg yolks and sugar together in medium bowl; then gradually whisk the hot milk mixture into the egg yolk mixture. Return the custard to the pot and stir over low heat until it thickens, about 5 minutes. DO NOT BOIL. The sauce is thickened when it coats the back of a wooden spoon. 4. STRAIN the sauce into a bowl, cover and chill until ready to use. 5. ASSEMBLE: Place the cake on a plate, topped with a scoop of sorbet. Garnish the plate with orange supremes, and add the sauce. Top with an orange peel curl and serve. 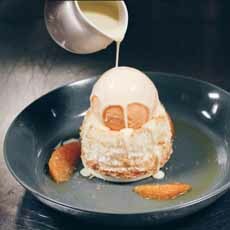 The easiest, and a favorite of ours, is a simple bowl of vanilla ice cream and orange sorbet (mango sorbet is a great substitute). You can also make vanilla cupcakes with orange frosting or top vanilla ice cream with orange liqueur. Also check out fior di Sicilia, an Italian essence used to flavor baked goods and beverages. Its flavor and aroma are reminiscent of a Creamsicle.